Don’t do what he did, says Huynh. Even better, take his class at the University of Toronto’s Mississauga campus: Introduction to Personal Finance, a new 11-week course open not just to business and finance majors but every other undergraduate student, too. Since its launch last year, enrolment has tripled. To accommodate demand, three cohorts are now available for 300 eager students, 95 per cent of them coming from non-business backgrounds. Few are particularly financially literate, regardless of major. “I was surprised at the lack of base knowledge,” admits Huynh. A 2017 PricewaterhouseCoopers study found that millennials are generally better educated and more skilled than their parents were at the same age, but only 24 per cent have basic financial literacy (meaning an understanding of assets, expenses and income). Just eight per cent have high financial literacy, including a grasp of taxes, mortgages and investing. “We take these students all the way from the basics—like the differences in bank accounts, how to maintain your credit score, different investment products—all the way to alternative loans and real estate and starting a business,” he says. “Before this course, I always imagined myself in a regular nine-to-five, climbing up the corporate ladder,” says Josh D’Lima, a fourth-year business student and one of Huynh’s first students. “But when I thought about my goals, I saw that that wasn’t going to be enough. I wasn’t about to settle for half of what I wanted, so I had to make it happen.” After Huynh’s class, D’Lima bought two rental properties that pay for themselves and generate more money than an entry-level job. There is now frequent discussion of mandatory money courses in high schools (or earlier), but even university-level courses are often lacking. “The business program is very theory-based and not so much based on real life,” says D’Lima. By necessity, more and more alternative learning opportunities are presenting themselves at Canadian schools. 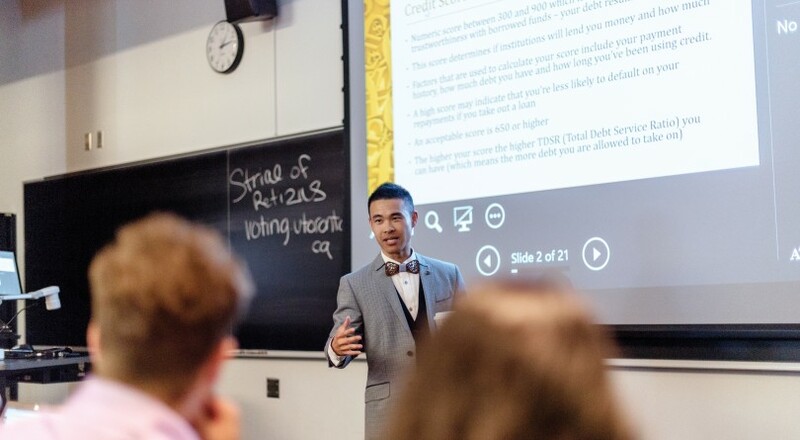 At the University of Waterloo, students are invited to apply for a position in two extracurricular clubs, the Student Investment Fund and the Student Venture Fund. Both offer hands-on training in portfolio and venture investment, with real money—beneath the watchful eyes of industry experts. An anonymous external donor provided $250,000 to the university in 2012, and profits are rolled back into the fund. It’s too easy to blame youthful indifference for financial illiteracy, though; the same problems plague continuing education. For the U of A’s faculty of extension, where the average student age nears 40, it’s difficult to fill the seats in any money course—or keep them there. “The rise of direct and online banking in the early 2000s did empower people to manage their own money,” says Christie Schultz, the faculty’s assistant dean. In 2003, they launched courses called Personal Investment Strategies and The Art of Investing, though enrolment dwindled during the recession, and both were cancelled in 2013. It’s not as bleak as it might seem, says Schultz. “The expectation for such courses is now being served in other ways. Our alumni association now offers one-day workshops called the Educated Wallet that are actually very popular.” For $75, workshop-goers get a commitment-free crash course (for example, “Retire Happy” in April, or last fall’s “Financial Fundamentals”), no homework and a free lunch. Perhaps a conventional university course on finance—especially for anyone with sub-par financial skills—feels intimidating, time-consuming or overwhelming. Maybe an English or philosophy major fears a room of math wizards and decides they’d prefer a breezier elective. Perhaps they assume everything you need to know is available online somewhere anyway—without homework, and for free. They would be right. Marc Bachand, professor at the Université du Québec à Trois-Rivières, offers a massive open online course (MOOC) on personal finance. In 2015, just as MOOCs became trendy, Bachand thought to combine the open-course concept with personal finance, his particular expertise and already his day job. “We have all kinds of finance courses—that’s my regular work here—but we had to change the approach to reach the biggest population possible,” he says. The free, five-week online class covers personal finance, taxes and tax breaks, growing your personal wealth and a (voluntary) final exam. About a quarter of students study up and write the test, just for fun. Though technically a university-level course, Bachand has carefully designed the program with accessibility in mind. Anyone intimidated by higher education absolutely should not be, he says. “This isn’t an educated or not educated thing; 44 per cent of people are living paycheque-to-paycheque just the same. These are the people we’re appealing to.” So far, 20,000 people have completed his course in three years. For comparison, the university has 14,000 students enrolled.